This week, the Canadian Diabetes Association announced 30 diabetes champions across the country who will be honoured with Queen Elizabeth II Diamond Jubilee Medals. Peter McDougall, UNB's associate vice president of Human Resources and Organizational Development, is the only New Brunswicker to receive this award and one of only two Maritimers on the list. The commemorative medals represent outstanding Canadians who provide essential diabetes support. Recipients include volunteers who help raise funds and support research for a cure, passionate advocates who raise awareness for the cause and dedicated healthcare professionals working on the front lines to help people manage their disease every single day. "These medal recipients demonstrate a true dedication to making a difference in the lives of the more than nine million Canadians who live with diabetes or prediabetes," says Doug Macnamara, President and CEO of the Canadian Diabetes Association. "On behalf of the association, I would like to congratulate all recipients for their tremendous contributions to the diabetes community and express our sincere appreciation for all who were nominated." Peter McDougall has been an active volunteer with the Canadian Diabetes Association for more than a decade. 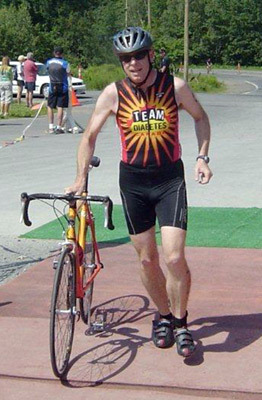 He has represented Team Diabetes in three international marathons and an Olympic-distance triathlon raising more than $20,000 in donations through these activities. He has also served as the organization’s regional chair for New Brunswick and, most recently, as chair of the National Advocacy Council. Peter has previously been recognized as the CDA’s National Volunteer of the Year and with the National Advocacy Leadership Award. Peter is a frequent media commentator on the personal and financial challenges faced by those living with diabetes and on the need for investment in research focused on prevention, treatment and a cure. The Diamond Jubilee Medal Program was created by the Government of Canada to celebrate the 60th anniversary of Her Majesty Queen Elizabeth II's accession to the throne as the Queen of Canada. Members of the general public were asked to nominate individuals for the medal program, which is administered by the Chancellery of Honours, as part of the Office of the Secretary to the Governor General. Across Canada, 60,000 Canadians, including individuals in the diabetes community are being recognized for their contributions to their community and country earning this prestigious Diamond Jubilee medal.